We have played together since 2000 and been in a 5 piece band for about 12 years. Norman plays drums and Graham lead/rhythm guitar. We don’t do many gigs, perhaps 4 in a good year, but we enjoy coming together to make music. We sometimes go for quite long periods without rehearsing because of work or holiday commitments. 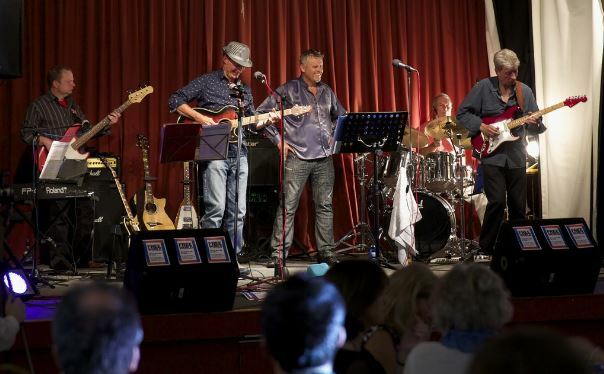 We play for personal pleasure rather than money, and enjoy helping others raise money for good causes. ​There are always tensions in a band as there is pressure to conform to what the singer can or wants to sing. Musically, this can be quite restrictive and this is a motivation for gettigng involved in other musical projects. Over the years Graham has composed and recorded many songs (tunes and words). He often joked that one day he would use the songs to create a musical. About 16 months ago, soon after he retired from higher education, Norman suggested that the time had come for him to create the musical he'd always wanted to make and offered to help. Norman created a narrative into which the songs could fit - a boy and girl fall in love, boy and girl fall out of love, boy and girl rediscover their love with a happy ending - sort of story. We used this narrative to re-write the words for some of the songs that Graham had already composed. We then recorded all the songs with a hand held stereo recording device and just the two of us playing and singing. We are now ready to take it to the next stage which involves finding people who can actually sing and other musicians to collaborate with us and making a much better recording using our new 16 channel digital recorder. In the run up to the #creativeHE conversation Norman persuaded Graham to join in. We discussed and agreed that we would try to compose and record a song within the framework of the musical we were working on. So that became our context and our ambition. In the story the main characters, a husband and wife, have grown apart and things have now come to a head to the point where splitting up seems inevitable. Here is the song immediately before the new one we are describing in this narrative. Circumstances were not ideal as I was away for a week immediately before the #creativeHE conversation and then Graham was away for a week during the conversation, then I had childcare duties when he came back. 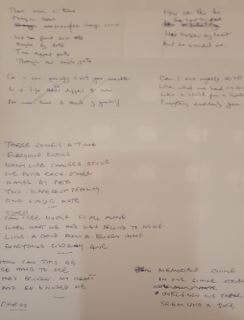 The net effect of all this was that we met once for 2 hours to develop and record some initial ideas, then Graham developed the song by himself, and then we met once to record the song together. Norman takes no credit for anything other than facilitating Graham's creative engagement and the synthesis on this page. The song is completely Graham's work. We are the first to admit that the result isn’t amazing but it fits into the narrative of the musical (the musical context for the song) and you have to imagine someone with a good voice singing it. But for the purpose of the #creativeHE conversation we are more interested in the process of making it and how creativity features in the process. The process of making is revealed in the artefacts that we made (video clips and audio files) below. In the first Graham composes the song (words and tune).In the second we record an evolved version of the song. The two audio clips reveal Graham's continued development of the song at home using the Garage Band app to make a recording. The final audio clip and video show us recording the song using our 16 channel mixer in our band rehearsal room. Norman did some post recording mixing and assembled the movie which is a mix of video and the mixed audio file. These are spontaneous clips and nothing has been rehearsed to show in a realistic way how songs are made. 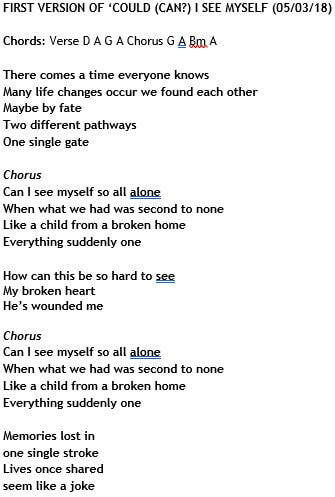 The first version of the song to emerge from this process is shown below. After Graham returned from holiday we agreed to meet up but I had to cancel because of an unforeseen commitment. Graham sent me an email with his further thoughts, an extension of the tune and an indication of the iterative and ecological nature of his thinking. All part of iterative process . Not had a chance to record it .. and may not until we meet .. house in a mess having gutted a room for the plasterer tomorrow. 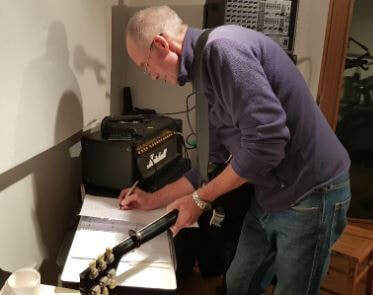 In the next stage of the process Graham made an accoustic recording at home using Garage Band app and then added some percussion using the app and recorded a version with him singing. This was the first time we could see how it all came together. Feeling that I had contributed nothing to this project I used Graham's audio file to make a short movie using four images of George Segal's standing woman looking into mirror 1995 I could not have done this without my earlier experience of using movie maker. ​Eventually we managed to meet up and record the song together on our 16 track mixer. I added drums and a bit of harmony to Graham's guitar and vocals. I also made a video recording on my phone todocument the process. The final stage in this process will be to mix the tracks using Studio 3 software. The sound file using 8 tracks is included below. The Garage Band version sounds better - the acoustic guitar provides a fuller sound and a number of instruments have been added in the processing.